Spotify coming to the U.S.: How free will it be? 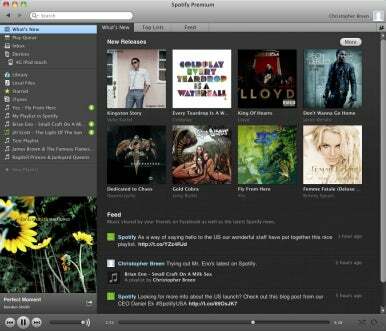 Spotify, the popular-in-Europe music subscription service has arrived in the U.S. The service is available in three flavors—free (you can listen to a limited number of hours of music per month at 160kbps), Unlimited ($5 a month with unlimited listening at 160kbps), and Premium ($10 a month with unlimited listening, 320kbps tracks where available, and support for downloads and mobile listening). I’ve had experience with the current crop of domestic streaming services—Napster, Rhapsody, Mog, and Rdio—and have now browsed through Spotify. Here’s what I’ve found while using a Premium plan. Note that the free service is invitation-only right now (submit your email at the Spotify website to request an invite), but those willing to pay for Unlimited or Premium access can sign up immediately. Paying customers also have the ability to invite five people with their accounts, but that option wasn’t enabled for me (probably because I’m using a press account). When you receive an invitation you'll be able to listen to six months worth of unlimited Spotify music at 160kbps. After those six months expire, these invitation accounts are limited to 10 hours of listening per month and five plays per track. After the invitation period expires and everyone can simply sign up for a free account, those with free accounts can listen to up to 20 hours of music per month for the first six months. After six months, it's back to 10 hours of music per month and five plays per track. There’s nothing new or mysterious about music subscription services. They’ve been around for years, but other than free services such as Pandora, the play-exactly-what-you-want-to-play-when-you-want-to-play-it-services haven’t caught on. Spotify hopes to change that by offering an ad-based free plan as well as heavily integrating social networking into its service. The idea is that your friends will encourage you to use the service by recommending music to you, which, in turn, may tempt you to pony up for the Unlimited or Premium plans to remove the restrictions inherent in the free plan. And, like Napster, Rhapsody, Mog, and Rdio, when you pay for the most expensive plan, you can then download any of the millions of tracks offered by the service to your iOS or Android devices for offline listening. In the world of streaming music services, having an application dedicated to the service is a big deal. On a computer, other services depend almost entirely on you accessing the service via a Web browser, which can be clumsy. Spotify has such a dedicated application and it’s not bad. Similar to iTunes, you find a library pane to the left side of the window, a now playing area below, play controls along the bottom, and a main pane that displays the contents of playlists as well as Spotify content such as What’s New, Top Lists, and Feed tabs. It’s within the library pane that you select what you wish to see in this main pane. For instance, click What’s New and you see eight album covers from recently released (and popular) albums. You can see additional new releases by clicking a More button. Regrettably, there’s no way to see a very long list of new releases—you’ll only see eight entries per page. However, click on the Top Lists link and you see a list of 100 top tracks and albums. Although these lists don’t necessarily contain all new releases, new popular releases are sure to find their way into these lists. Click the Feed tab and you’ll see not only news from Spotify, but also any messages you’ve posted as well as messages from your followers (more on the social networking aspect of Spotify in a bit). The Play Queue entry in the library pane displays everything you’ve added to your Spotify queue. These can be tracks from your local music library, Spotify tracks you’ve added, or playlists that you’ve downloaded. Click Inbox and you’ll see links to all the music tracks that have been sent to you. If you have the Premium plan, you’ll spy a Device entry. Select it and you’ll see a message to download the Spotify app for your iOS or Android device. (Currently there’s only an app designed for the iPhone/iPod touch, no iPad app, though the available app works perfectly well with an iPad, just in that smaller window, and only in portrait orientation.) When you download the app, fire it up on your device, make sure that you’re on the same wireless network as your computer, and enter your Spotify user name and password, the device appears in the Spotify application on your computer. At this point you can choose the music you’d like to sync to your device and then sync that music wirelessly. This is a big advantage over the current iTunes scheme, which demands that you physically tether your iOS device to your Mac with a cable. Finally, below this area you find your music library. This includes not only the contents and playlists from Spotify, but also the contents of your iTunes library and any other local music sources you’ve added (a folder full of MP3 files, for example). Note that the Spotify application can’t play protected music files purchased from the iTunes Store nor will it play videos. Protected files appear as salmon-colored tracks. You can ask the application to remove them from the list of available tracks (the tracks themselves aren’t deleted from your iTunes library). The Spotify application has a single Search field at the top of the window. If you choose the What’s New entry in the library pane and then enter a query in this field, you’ll search the contents of Spotify’s library. Choose Library instead in the library pane and you search the contents of your local library (including tracks downloaded from Spotify). When you search within Spotify’s library the top portion of the results contains pictures of any matching artists as well as Artists and Albums links. 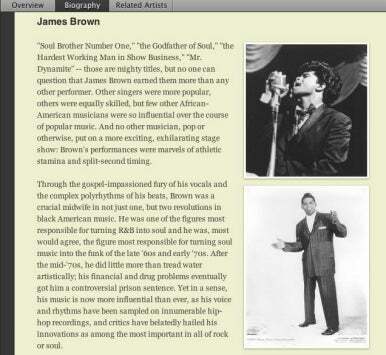 For example, I searched for James Brown and saw a single image of the youthful Godfather of Soul. In the artists links I found James Brown, James Brown & The Famous Flames, and The James Brown Band. When I clicked on James Brown & The Famous Flames a list of albums appeared below (with their contents listed to the right) as well as a Top Hits entry that contained five hits by Mr. Brown and band. The Albums links works similarly. Just click on an album link or album cover and the contents appear below. You can easily create a new playlist based on one of these links by right-clicking on it and choosing Add To New Playlist in the resulting menu. Once you’ve selected an artist you see Biography and Related Artists tabs. Both are welcome and useful. Not only does the biography contain helpful information, but it also has links to other artists important to this artist’s career. Click one of those links and you see their artist page, complete with links to other relevant artists. As a music geek, I love the Related Artists tab. Click it and artists who influenced or were influenced by your selected artist—as well as contemporaries of the artist—appear. Click one and you see their artist page. Good stuff. In Europe this pane also features an Artist Radio tab, where—as with Pandora and other music subscription services—you can create a music channel that plays music from (and similar to) a chosen artist. This feature hasn't yet been implemented in the U.S. In other ways Spotify’s Search feature is too limited. Say, for example, that I enter “Beethoven.” What I see is a long list of album covers complete with album contents arranged in no particular order. Using the Artists and Albums links I can narrow my search somewhat and I can enter a specific work—”Beethoven Symphony 7,” for example. But what I’d really like is a view—like iTunes—that places a load of album covers in a single pane with the album name and artist below. In this view I don’t care so much about what each album contains, rather I want to see more choices. The iOS app works this way—presenting a list of albums. I hope to see the computer application offer this view as well. Additionally, Spotify would benefit from an iTunes-like Power Search feature where you can more carefully filter results by choosing multiple criteria such as artist, album, composer, song, and genre. When you have the ability to play any of 15 million tracks the first question that should come to mind is “What should I play now?” After you’ve burned through the hits from high school you need to turn to a trusted authority for recommendations. Spotify’s Top Lists can help, but if you’re not into today’s top-o-the-pops, forget it. Instead, you turn to sites that publish Spotify playlists and your friends. For example you might travel to ShareMyPlaylists or check out Spotiseek where, as with Pandora, you can enter the name of an artist you like and have the site generate a Spotify playlist of related music for you. 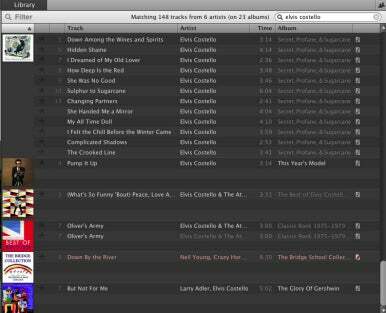 Add these playlists to Spotify and you have access to the music they contain. But some of the best recommendations you may get are from friends. Similar to hanging out at your pal’s house in more innocent days and playing tracks for each other, Spotify’s social services let you recommend tracks and playlists to others. 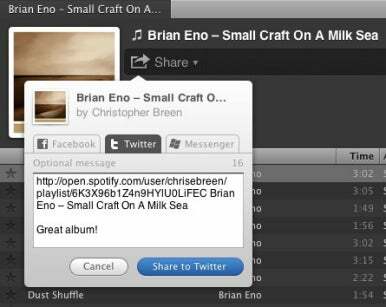 You can do this by sharing tracks and playlists with friends you’ve added to your Spotify crew or by posting links to Twitter or Facebook. iTunes also has links to Facebook and Twitter but it’s not the same thing as you can’t listen to tracks in their entirety nor assemble playlists. Spotify faces the majority of hurdles that other subscription services have dealt with. Some people simply will not pay to stream music and are happy with the music they own (or are happy with the great results they get from Pandora). While other subscription services offer many of the same features as Spotify (and implement some of them better), the singular advantage that Spotify enjoys is its free plan. Rhapsody, Napster, Mog, and Rdio all offer free trials, but they expire at the end of one or two weeks. Although limited to a certain number of listening hours per month and ad-based, Spotify’s free plan lets users get an idea of what a subscription plan might mean for them over the long haul. Having the freedom to choose exactly the tracks you want to hear or play a playlist full of tracks recommended by your best musical buddies is attractive, but it may be a thrill that wears off after a month or two. We’ll see if it’s attractive enough to those free subscribers who have stuck it out to start paying to keep their nearly endless library of music flowing.